Edgar Perez, former McKinsey and IBM consultant, is a global speaker and author of The Speed Traders, Knightmare on Wall Street, and the forthcoming The 11th-Hour Deal, Behind Washington’s Closed Doors During the 16-day Government Shutdown of October 2013. New York, NY, USA (February 14, 2014) — Knightmare on Wall Street, The Rise and Fall of Knight Capital and the Biggest Risk for Financial Markets, was recently reviewed by The Huffington Post which praised its “great historical analysis and insights into what exactly went wrong” with Knight Capital. “Edgar Perez’s book takes the reader on a wild ride. A forensic analysis showed how an old forgotten line of code, like an ex-girlfriend, showed up and turned itself on, which began instantly trading a cascade of orders. By 10:00 am that morning, the Knight Capital IT team was able to stop the program, but it continued finishing trades for the next fifteen minutes. Then they began to assess the damage. James Grundvig, author of the review and CEO/Founder of CloudNician LLC, concludes: “From a platform launch with a morning cup of coffee, to the brink of bankruptcy in less than an hour, Knightmare is a book that is both a page-turner and modern historical drama with outsized egos, supersized packages, and bailouts from rivals who turn into sharks in a chum feeding frenzy.” The full review can be accessed here: http://www.huffingtonpost.com/james-grundvig/book-review-the-meltdown-_b_4719207.html. 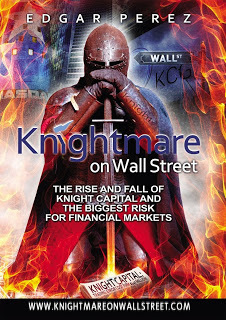 Knightmare on Wall Street (http://www.knightmareonwallstreet.com), the fascinating story of Knight Capital, was also the most favorably reviewed Kindle edition book on Amazon in 2013, with an average rating of 5 out of five stars. Knight Capital, founded by Kenneth Pasternak and Walter Raquet in 1995, had seen its fortunes change as U.S. regulators made a series of changes in the structure of financial markets and computers were progressively expanding their share of trading. The Flash Crash, the infamous 1,000 point drop of the DJIA on May 6, 2010 (the largest one-day point decline in history), illustrated how market structure problems could almost instantaneously cascade from one market participant to the rest. Mr. Perez (http://www.mredgarperez.com) is widely regarded as the preeminent global expert in investing and high-frequency trading. He is author of The Speed Traders, An Insider’s Look at the New High-Frequency Trading Phenomenon That is Transforming the Investing World, published in English by McGraw-Hill Inc. (2011), published in Mandarin by China Financial Publishing House (2012), and Investasi Super Kilat: Pandangan Orang dalam tentang Fenomena Baru Frekuensi Tinggi yang Mentransformasi Dunia Investasi, published in Bahasa Indonesia by Kompas Gramedia (2012). Mr. Perez is course director of The Speed Traders Workshop, How High Frequency Traders Leverage Profitable Strategies to Find Alpha in Equities, Options, Futures and FX (Hong Kong, Sao Paulo, Seoul, Kuala Lumpur, Warsaw, Kiev, New York, Singapore, Beijing, Shanghai). He contributes to China’s International Finance News and Sina Finance and The New York Times. Mr. Perez (http://www.facebook.com/AmericasUltimateNetworker) has been interviewed on CNBC, FOX BUSINESS, Bloomberg TV, CNN en Español, Sina Finance, BNN’s Business Day, CCTV China, Bankier.pl, TheStreet.com, Leaderonomics, GPW Media, Channel NewsAsia’s Business Tonight and Cents & Sensibilities. In addition, Mr. Perez has been globally featured on FXFactor, Columbia Business, OpenMarkets, Sohu, News.Sina.com, Yicai, eastmoney, Caijing, ETF88.com, 360doc, AH Radio, CNFOL.com, CITICS Futures, Tongxin Securities, ZhiCheng.com, CBNweek.com, Caixin, Futures Daily, Xinhua, CBN Newswire, Chinese Financial News, ifeng.com, International Finance News, hexun.com, Finance.QQ.com, Finance.Sina.com, The Korea Times, The Korea Herald, The Star, The Malaysian Insider, BMF 89.9, iMoney Hong Kong, CNBC, Bloomberg Hedge Fund Brief, The Wall Street Journal, The New York Times, Dallas Morning News, Valor Econômico, FIXGlobal Trading, TODAY Online, Oriental Daily News and Business Times. Mr. Perez (http://www.weibo.com/edgarperez) was a vice president at Citigroup, a senior consultant at IBM, and a strategy consultant at McKinsey & Co., the American global management consulting firm that focuses on solving issues of concern to senior management; the firm serves as an adviser to businesses, governments, and institutions around the world. McKinsey is widely considered to be the most prestigious management consulting firm in the world, with over 100 offices in 60 countries. Mr. Perez (http://en.wikipedia.org/wiki/Edgar_Perez) has an undergraduate degree from Universidad Nacional de Ingeniería, Lima, Peru (1994), a Master of Administration from Universidad ESAN, Lima, Peru (1997) and a Master of Business Administration from Columbia Business School, New York, with a dual major in Finance and Management (2002). He belongs to the Beta Gamma Sigma honor society. Mr. Perez (https://twitter.com/mredgarperez) resides in the New York City metro area and is an accomplished salsa and hustle dancer. This entry was posted in Books, Business, Press Releases and tagged $440 million, algorithmic trading, august 1, barbarians at the gate, bats, book review, citadel, den of thieves, direct edge, facebook, financial markets, flash crash, getco, high frequency trading, ibm, investors, it department, jersey city, kcg, ken pasternak, knight capital, knight capital book, knight capital getco, knight capital glitch, liar's poker, mary schapiro, michael tobin, nasdaq, new york stock exchange, nyse, operational risks, pricewaterhousecoopers, retail liquidity program, rlp, sec, shareholders, software, steven sadoff, the rise and fall of knight capital and the biggest risk for financial markets, the speed traders, thomas joyce, traders, trading disaster, virtu financial, wall street, walter raquet, when genius failed. Bookmark the permalink.